Adherence is the fancy word for “following doctors’ orders.” What it really means, for most people, is remembering to take your medicine. It may sound simple, but as many as 50% of people do not take their medicine correctly. They forget doses, take medications at the wrong time, ignore instructions, and even deliberately change doses taking more or less than they should. For the vast majority of health conditions, medications are the only thing that doctors have to help make you better (surgery is the other major tool). That’s it: medications and surgery. The rest of a doctor’s tools and technology are diagnostic. In other words, the tools are things to figure out which medication (or surgery) you need. If you get your prescription filled and don’t take actions to make sure you take your medications correctly and on time, you are undermining your treatment and potential progress either in curing your ailment or effectively managing it. 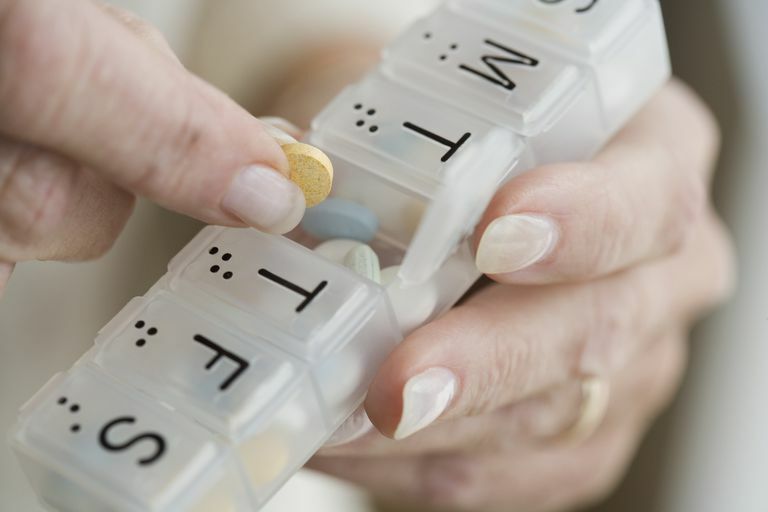 For those of us who have difficulty keeping all of our drug therapies in order or who simply find it difficult to maintain our prescribed medication regimen, these tips for remembering your medications and sticking to your treatment plan may provide a solution. The simplest method for organizing your medications is a pill box. Once a week, you will set aside some time to organize your pill box by putting your medications into each little container for each day of the week. Not only does this practice ensure that you take all of your necessary daily medications, but it is a great way to ensure that you always know if you have already taken your medications or not. You can get simple pill boxes at your drug store or pharmacy. They come in many varieties of different sizes, colors, and shapes to ones that lock or are easy-open. There are even pill boxes available for people who need to take medication 3 times a day or more. The pillbox is also a great way of seeing just how often you forget to take your medicine. You can’t argue with yesterday’s pill that is still sitting in the box. "Out of sight, out of mind" is really true when it comes to medication. Place your medication or pill box out in the open (but away from pets and children) where you can see it. This is especially important in the first week or two of taking a new medication. After your medication habit is strong, you can put the medicine away. Just try not to put it away until you’ve had two full weeks of not forgetting a dose. You may even find that keeping your morning dose with your toothbrush or coffee maker or your evening dose on your nightstand will prompt you to take your medications daily. It’s a lot easier to remember something pleasant than something unpleasant. Use this to your advantage by linking taking your medicine on time with some reward (like a piece of chocolate). You can very quickly develop a habit of enjoying a piece of chocolate (or other pleasant things) at a certain time of day. Your craving for the chocolate may even trigger your memory to take your vitamins! Believe it or not, doing something silly just before you take your pills can help you remember your medicine every day. Researchers actually tested this idea by having seniors, in a lab, put their hand on their head before doing repetitive memory tasks. When the seniors did this, they were able to remember the tasks better. The idea with this tip is to do something unusual when you go to take your medicine (tap your head, knock on wood, snap your fingers, etc.). By adding in another sense (touch), you’ll increase your chances of remembering your medications. You may be surprised how often someone forgets what medications he is supposed to take or forgets about certain medications entirely. Keep a current medications list, complete with dosage and any special instructions. Refer to the list weekly when you fill up your pillbox to make sure you aren't forgetting anything. You will also find this list helpful when seeking a new medical provider. Most new patient intake forms ask for a list of current medications, and the more accurate detail you give, the better. While you're at it, try these other tips for optimizing your medical care. Another common reason people miss doses is that they forget to fill their refills before it's already too late. If you have a good pharmacy, they may call to remind you, but ultimately it is up to you to stay on top of your prescription refills. So try marking your refill dates on your calendar, with a reminder to pick up refills before you are completely out. This is especially important if you use a mail order pharmacy and you need to allow for medications to be shipped to you. Some mail-order pharmacies even offer an auto-refill program. Look into your options with the medications you take regularly. Another common reason people miss doses intentionally is that they believe the medication is making them sick or giving them unwanted side effects. Before you blame the medication, check with your pharmacist to make sure that your medications aren't fighting with each other. Be sure to also consider any natural or herbal supplements you are taking as well. Always carefully read labels about foods that may interfere with the effects of your medications and remember to follow your doctor's instructions. If a medication is specified as "should be taken with food" or other similar instructions, be sure to adhere to them as they may help you avoid symptoms like upset stomach or more serious side effects. A Silly Pat on the Head Helps Seniors Remember Daily Med. Newswise Medical News. July 2009.